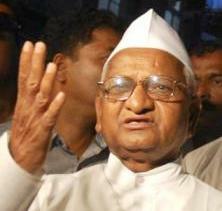 The campaign of receiving '25 crore missed calls' in support of the Lokpal Bill will run up to June 28. To support the campaign we have to simply give a Toll Free Call to (+91) 0-22-61550789. The Call gets disconnected automatically after 1 ring. After giving a call to this number, caller will receive a Thanks Message in his cell. And there is no charge for that. The support of 25 Crores of people is needed to implement The Lokpal Bill. I have expressed my support, you also come forward with your support, if you desire so morally.